Bacground: This article tackles social support as a meta-variable that is reinforced by a set of social variables, which correlate and act as predictors of social welfare and life quality of the older person. Objective: The objective of the study is to know how social support, networks and social contacts can influence the health of the elderly person, especially if these are interrelated factors. Method: The population studied are individuals from both sexes living in Toledo (Spanish people) and who were 65 years of age or over. Several scales were applied to assess the frequency of and the degree of satisfaction with perceived social support received from different sources in relation to social support. The co relational analysis showed significant positive associations between scores and measures of and social support, social relations, contact and social networks. Results: We conclude that the support in general is very good, over 90% of people from the sample have someone who would help if needed. 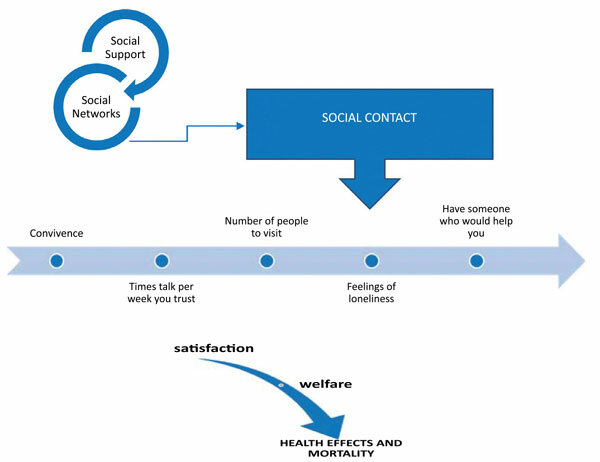 Social and health factors are interrelated with social support. Social contact can also be considered as a life quality estimate. He progressive loss of contact over the years is a social factor that affects the quality of life. Conclusion: The meta-analysis we find that social support and the emotional factor, along with social interactions, have powerful effects on preventing morbidity and mortality, which are important social indicators. We conclude that social support based on positive social interactions provides an optimal state of health in the older person. Keywords: Social support, the older person, health, social welfare, old people, morbidity. Keywords:Social support, the older person, health, social welfare, old people, morbidity. Abstract:Bacground: This article tackles social support as a meta-variable that is reinforced by a set of social variables, which correlate and act as predictors of social welfare and life quality of the older person.